Thank you for your interest in St. Clare School, and welcome! St. Clare Church celebrated its first Holy Mass on Sunday, August 17, 1913. Father Capistran Damek, O.F.M. welcomed over 30 parishioners that day. Just over one year later, on September 10, 1914, the Ven. Mother Willamine, Superioress, and Rev. Mother M. Pauline arrived at St. Clare. Four days later, the two Franciscan sisters opened the doors of St. Clare School to welcome 31 children. Today, St. Clare Church serves over 1,000 families and St. Clare School enrolls 200 children with an enduring tradition of academic excellence within a faith-filled community. In fact, when surveyed in fall 2018, our current parents cited academic excellence, a safe, supportive environment, and strong Catholic faith formation, all underpinned by the strength of the St. Clare community, as the top reasons they send their children to St. Clare School. In addition to classroom learning, we also offer opportunities for after-school enrichment, including Drama Club, Battle of the Books, MUSE Band, Mad Science, 100 Mile Walking Club, and more. St. Clare School celebrates a number of annual events, including blessing of our pets on the feast day of St. Francis and BINGO night in the fall, and Fitness Challenge each spring, to name a few. Students at St. Clare School are provided with the tools they need to develop emotionally, intellectually, physically, and spiritually in a caring and creative environment. With an average class size of 25 students, students realize their full academic potential in an environment that promotes confidence and self-esteem. 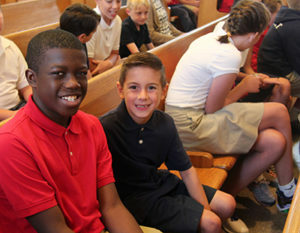 As important as academics are at St. Clare, we place an equal emphasis on community. Our students acknowledge the dignity and worth given by God to all people. The entire student body, faculty, and staff participate in our school’s community programs, providing direct service to the poor, hungry, medically fragile, homeless, elderly, and underprivileged children. St. Clare is a small school with a big heart! We invite you to visit us to learn more.